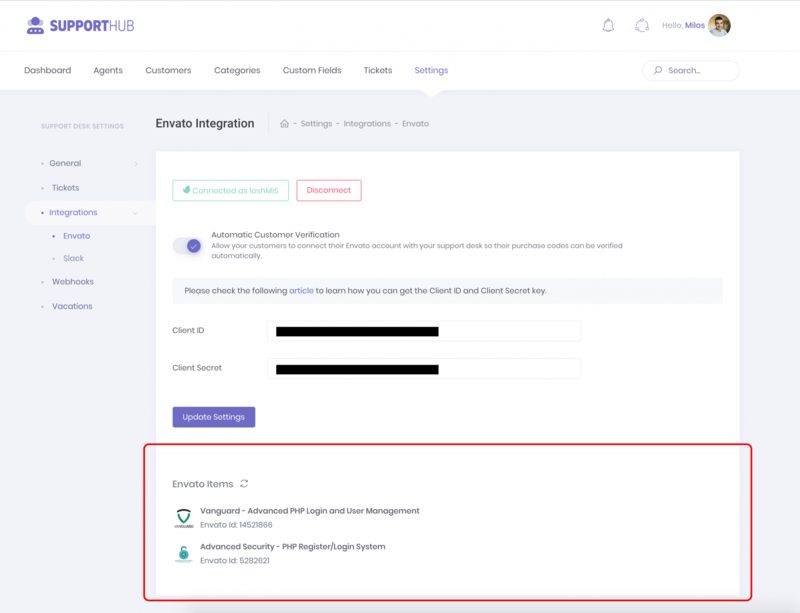 To be able to provide the support and actually be able to use the Support Hub, you will need to create support categories. However, if you have a lot of items on ThemeForest or CodeCanyon, creating those categories manually, one by one, can be a pain. But don't worry, we thought about that too. Support Hub allows you to easily create support categories from your Envato items. Everything you need to know about connecting your Envato account is explained inside the Envato Integration article. Once your Envato account is connected, Support Hub will fetch all the info about your ThemeForest and CodeCanyon items and they will be visible on "Settings >> Integrations >> Envato" page. The modal with all your Envato items will appear where you can select the items for which you want to create your support categories. Once you have selected the desired list of items, click the Create Categories button and you are good to go. Support categories will be automatically created and associated with those items and your help desk is now ready to accept support tickets.